It’s 2:30p.m. We’re a rapt movie house audience eager for the main event. Roughly 20 people apiece line the two long tables in the small space ahead of the kitchen that’s visible via a wide opening broken by a series of open shelves—a bit of ingenuity for anyone serving over 1,600 plates for a single dinner. Cicala is bulling through the pressure as him and his staff move in tight, focused movements. A room giddy with expectation. I’m seated at the kitchen end of one long table, opposite Mark Jurdjevic, a Machiavelli scholar from York University in Toronto who met Cretarola in an Italian class in Florence. They bonded over their mutual love of Italian history, literature, and food, along with their disdain for their less than erudite classmates; “it was always dove é il discotheque più vicino [where is the nearest discoteque],” doing his best impersonation of a member of the scantily clad Serbian contingent that dominated the class. Prior to opening Le Virtú, Cretarola would cook for him and his wife after they shopped together at The Italian Market,or they would go to L’Angolo Ristorante Italiano on Porter St., or the now defunct Bon Appetito on 16th and Ritner. 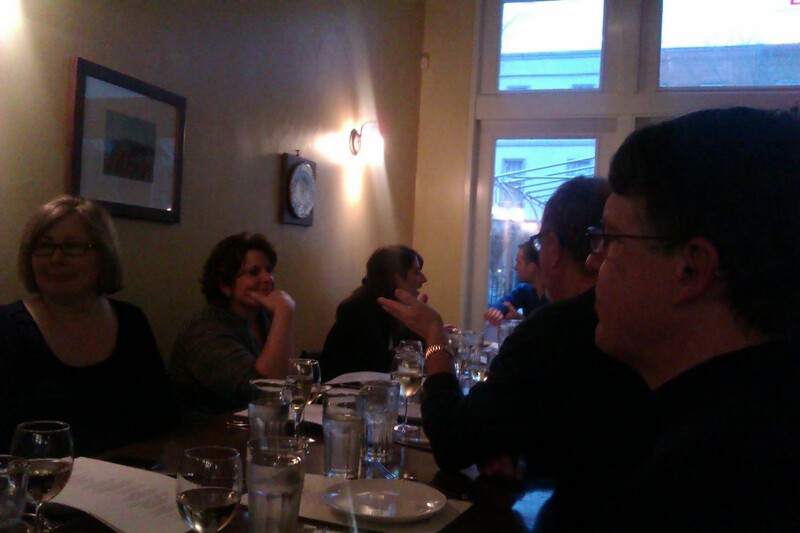 To my left at the head of the table is Jurdjevic’s friend Scott, a former academic who moved into the restaurant industry after specializing in Italian history. The three of us compare notes about trips to Italy and the food, while Jurdjevic, a diehard Maple Leaf fan, triggers numerous laments about The NHL lockout. Fittingly, for someone writing their second book on Machiavelli, Jurdjevic continuously assesses the course of the meal, while looking ahead, with Scott’s commentary making it clear that we all plan on making it to the finish line. The waitstaff fill our flute glasses with the sparkling wine as the first plates are berthed through that lattice opening: an ensemble of two fried ellipses, a beautiful, fat encrusted cod fritter, and a herb studded fried Jewish artichoke. The porchetta stuffed olive weds brininess with the sweetness of pork, this juxtaposition enjambing nicely with the buttery notes of juicy baccala brought to an indulgent crisp along the top—a baccala fritter without any breadcrumbs. The suppli al telefono brings the phone line stretchiness of mozz at the center of an equally creamy risotto, while the buttery, garlic and herb inflected fried artichoke is the clear winner. 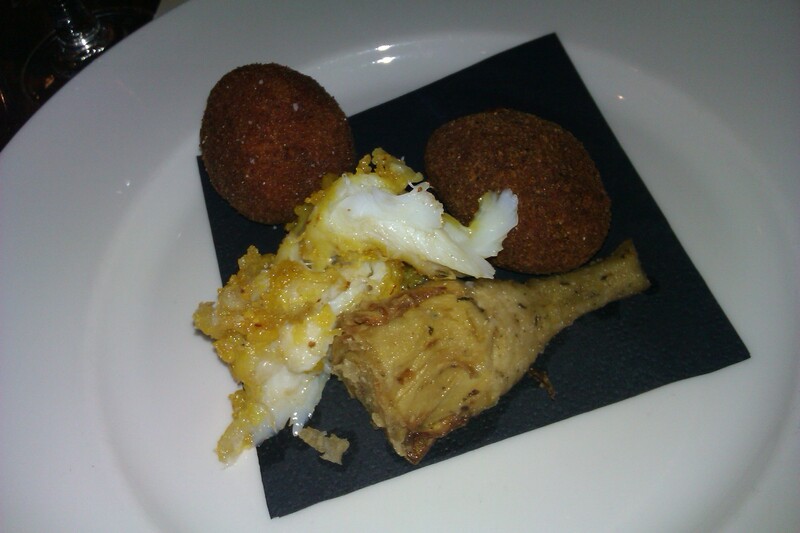 As much as the suppli al telefono surprises—as the second fried ellipse, I thought it was another blend of olives and pork—with its stringy mozz, so did the sparkling wine, in the way it played wedding announcer, calling out each fatty, herbal, and briny highlight. Then, it’s on to the next stanza, heralded by the arrival of the Cococciola. As I would throughout the night, I head into the other room to visit the wine guys, their corner niche having the feel of a back room in some old world tavern. The acidity is obvious right away, with the slight creaminess following to coat the mouth. “What else?” I ask. I try to get a sense of the green apple flavor Amoroso tells me I should be experiencing on the front end. With the first dish of the primo servizio di apertura, the acidity of red sauce bathing stewed cuttlefish jumps out along with the wine’s velvety character. Still, the fruit end comes through only as a bit of sweetness, which isn’t more apparent until I pair it with the gambari (prawns) in padella and chick pea puree. The creaminess stands out more as it forces me to take notice of every fat molecule in the puree. Finally, I taste some of those apples as they force the basil emulsion to sing with more clarity. 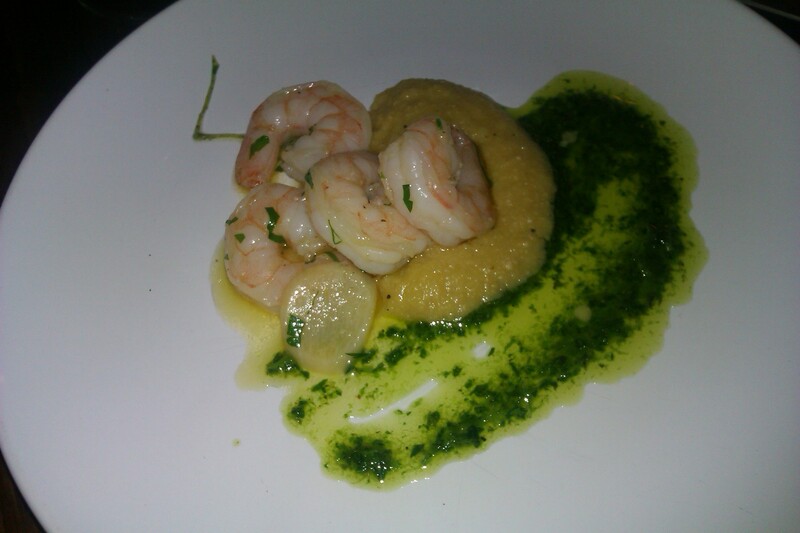 Gamberi in padella with chickpea puree. Back at my seat in the other room for the next stanza, I get the sense that this is as much about the wine as it is about the food, with each ingredient amplified equally doing a solid for a given characteristic of this incredibly nuanced wine: the herbs in the broth surrounding mussels and clams calling out subtleties of green apple; the mouth coating fat of whole roasted turbot reinforced by the wine’s texture, while the complexity of flavor (herbal/salty/fatty) of a green olive mash offers a cram session in all this wine offers. My head is soon spinning from the experience. Okay, it isn’t just the experience. By my count, I’m on my 3rd glass of Cococciola, after about 3 of the opening sparkling Pecorino. Maybe I had it all wrong from the start—it isn’t the food that I need to worry about. If Death Race 2000 is an appropriate metaphor for this insanely long dinner, I could soon find myself veering off a cliff.